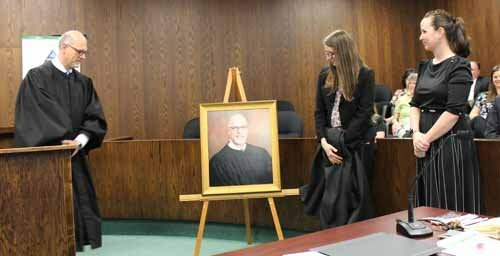 Every judge who has served the Lycoming County Bench has had his image memorialized for posterity. Whether by paint, ink or photograph, the Lycoming Law Association has commissioned the preservation of judicial portraits, beginning with Benjamin S. Bentley, Sr., the first judge to serve the new Lycoming County judicial district. 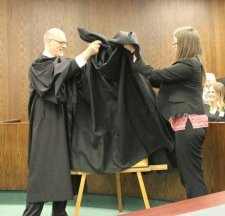 On May 4, 2018, recently elected Lycoming County Judge Eric Linhardt unveiled his portrait, at the Law Day Celebration at the county court house. The portrait, by photographer Whitney Hart, was presented to Judge Linhardt by Jennifer Heverly, Association president. 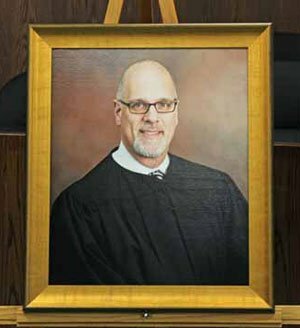 The portrait will be displayed with the other portraits of recent judges in the juror's lounge. Judges who served in earlier years have their portraits displayed in the LLA office.